"3LA1, V-2340" by Timothy K. Perttula and Robert Z. Selden Jr. CONTEXT INFORMATION: From a grave (Burial E) in a cemetery excavated by W. Gamel Smith in the fall of 1941. Associated funerary objects include V-2338, 2339, and 2341 and a jasper arrow point. DECORATION: The rim has single rows of tool punctations, one row under the lip and the other at the rim-body juncture. Horizontal brushing fills the area between the tool punctated rows, along with two opposed appliqued nodes in the central part of the rim. The strap handles have opposed and overlapping brushed marks on them. The vessel body has a series of nine appliqued chevrons that extend from the rim-body juncture to near the base. The area defined by each of the appliqued chevrons is filled with opposed brushing; eight of the appliqued chevron areas also has a small centrally placed appliqued node. 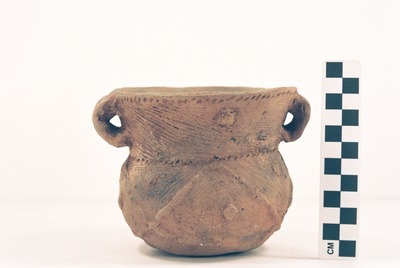 Haley Complicated Incised jar (5425-692).